"The Black Museum. A Repository of Death. day objects . . . all are touched by murder." A pink powder puff and a spotted bed sheet. A tan shoe and a rain slicker. Each week, Orson Welles walks through the museum, picks up one of these objects and tells its murderous horrific story. 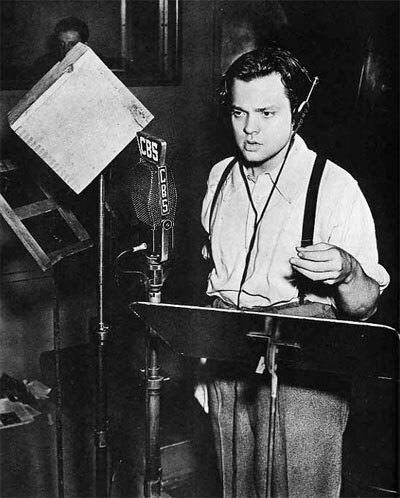 After each dramatization, Orson Welles ends the show as he did in Mercury Theater of the Air, "obediently yours.Black Museum is based on Scotland Yard's Black Museum (aka Crime Museum) in London, where crime artifacts are stored. This is the largest and oldest museum of its type. Although it is not open to the public, we can get a glimpse of what lays inside through Black Museum. Each program is based on a real crime story and object from the museum. Also included in the 'extras' folder is an intriguing list and short details of many of the actual murder cases matched up with the episode titles. See also: The Police Reporter and Somebody Knows. 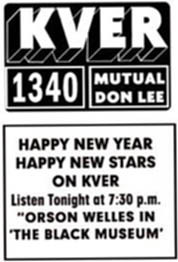 Black Museum with Orson Welles was an interesting listen. I worked at Scotland Yard as a police officer for a while, dragging bodies out of the Thames River, mostly gangland murders, but I found it interesting. Keep up the good work!